Guests includes: Stan Lee, George Pérez, Marv Wolfman, Peter David, Barbara Kesel, Tim Bradstreet, Tommy Castillo, Amanda Conner, Joseph Linsner, James O'Barr, John Romita Sr, Steve Rude, Maggie Thompson, Andy Smith, Jeff Johnson, Joe Jusko, and more. A first: according to Mr. Perez, this is the first time he's been asked for a con sketch of Mxy. He said it was refreshing to do a character that isn't always requested. This was on Saturday of the convention. On Sunday, I tried to surprise Mr. Perez again, by requesting Sabretooth. He told me that he's done that character once before, so I've got a first and a second. Sketched at the Comic Book & Pop Culture Convention in Pasadena, 2003. Well, I have no idea where to really start because I don't know much about Creation Entertainment's Comic Book and Pop Culture Convention. The con was held at the Pasadena Convention Center from January 31 — February 2. My comic book retailer had a flyer on the show and I heard a few people mention it, so I thought it might make for a fun Saturday adventure. My husband and I thought it best to arrive be there for the noon opening with hopes that we would have enough time to see everything by the 6 p.m. closing. Quite a few other people were making their way to the con at the same time, so we bought out tickets with anticipation. Each ticket cost $20, which caught me by surprise since it seemed a little expensive. ...Throughout the day, I was able to chat with Barbara Kesel, George Perez, Andy Smith and Jeff Johnson from CrossGen. I also chatted with several other interesting creators and fans even though I can't remember their names. Many other fans also had the same opportunity to chat with creators without the incredibly long lines. Among those who commanded lines, were John Romita Sr., John Romita Jr. and Stan Lee. 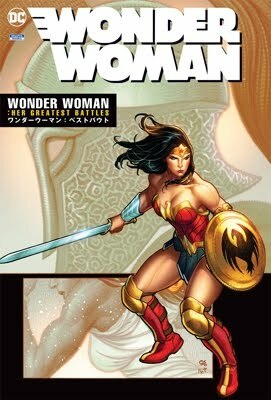 I posted a message in your forum a while back that you put on your home page -- it contained information about getting commissions from George, based on my experience at the Creation Con in Pasadena, where I obtained a Wonder Woman piece from him. Another guy (kevibabes) posted a reply saying he'd like to see it, so I'm sending you a scan... sorry, my scanner isn't that big, so it cut off the top and bottom, but this is most of the image. Needless to say, I couldn't be happier with it. Like I said before, George really goes out of his way to do amazing work for his fans. Ah, my recent trip to Pasadena and Los Angeles: A combination of the real and the surreal, the sublime and the ridiculous. The Pasadena Creation Convention. The weekend of Jan 31-Feb 2. I'd been contacted by acclaimed 'Nam writer Doug Murray on behalf of the Creation organization, asking if I'd be interested in attending. This was a convention with a guest list that included Stan Lee, Marv Wolfman, Len Wein, George Perez, Russ Heath, John Romita Senoir, John Romita Junior, Amanda Conner, Jimmy Palmiotti, and Many More (not to be confused with Manny Moore, Alan's brother that no one talks about). Well how could anyone pass up a convention with a line-up like that? The answer, unfortunately, seemed to be Pretty darn easily. Saturday, the big day - Stan the Man was there, for crying out loud - wasn't that much better. Approximately 800 in attendance at a convention expecting several thousand. I heard various complaints or explanations as to why. For instance, although the show advertised in CBG and Wizard, reportedly, there was a paucity of local push. A comic-book store not three blocks away from the enter was devoided of fliers. Newspapers coverage was minimal to nonexistent. Some complained about the at-the-door price of $20 and even thought the parking fee of $7 was too much. I had trouble relating to that myself probably because I'm from New York, where $7 gets you parking for 10 minutes rather than all day, and Broadway shows are averaging $75 a ticket. I attended the Creation Con in Pasadena a month ago, and got a commission from Mr. Perez. Information I got on this site was very helpful to my preparations (i.e. knowing how much it would cost, etc. ), so I thought I'd share some commission related tips/info I learned in case it helps others. Prices, as stated elsewhere here, are $60-65 for a head shot (George does them nice and large) and $150 for a full figure drawing. But be advised he will only accept a full-figure commission if you are coming back the next day. This is because he does the drawings at night in his hotel room; he doesn't feel he can do quality full-figure work there at the con with all the distractions. And believe me, the work he does is amazing; you'll be glad he took the extra time. So, if you weren't already, plan on going back the next day. In my opinion it's totally worth it to spring for a full-figure piece. The image is the size of an original cover drawing (bigger, actually, because he doesn't have to leave room for the logo) and will be an iconic full-figure shot of the character. Think about how much a Perez cover would cost you and you'll see why I think $150 is such a bargain. If you can't make it to a con but you want to commission a piece through the internet (theartistschoice.com), or you want a specialty piece (i.e. more than one character), George said his waiting list is over a year long. But he added that he sometimes skips ahead to work on a character he hasn't done before (or in a long time); he gave the Inhumans and Vampirella as recent examples. So if you want a character he hasn't done that often, your chances of getting it back quicker improve. All in all, I came away very impressed with Mr. Perez's friendliness, work ethic, and dedication to doing the best work he can for his fans. I'm thrilled with the Wonder Woman piece he did for me. I hope those of you going to future shows find this information helpful. The con provided several highlights. The first was getting together with my old pal, George Perez. George came out for the show and we had a great time talking about the old days. Also there was Barbara Kesel. Barbara is a dear old friend and was once my assistant on Titans and others and then later served as my editor. Barbara is also a good writer and you can read her most current work over at Crossgen. Len, Barbara, Bob Skir (An animation writer/story-editor), Maggie Thompson (editor of the Comics Buyers Guide) and I then went to see a sneak peak of Daredevil. Tickets were being handed out to almost anyone who could breathe. I was really interested because, well, besides it being a super-hero movie about a character I once wrote, it features a character I created: Bullseye. My creation aside, I think Bullseye steals the movie. Colin Ferrill looks like he's having a ball. He not only chews up the scenery, he uses the dessicated wad as a weapon. Also, I've never seen a movie theater that had self-serve soda machines before. That was like the coolest thing ever. Also, as a VIP guest (Thank you, Jeff) we had special tickets which would give us any and all refreshments. How can that not be a great time? After Daredevil was over, we called George - who didn't want to see the film without his wife - and we all got together for dinner. We talked, ate, talked some more, ate some more, and had a great, great time. We argued movies, tried to decide who should play Doc Ock in the 2nd Spidey movie, discussed comics, the Crisis and the Titans as well as many, many other books. Len showed everyone xeroxes of his upcoming DC Batman/Poe five part Elseworlds Book, "Nevermore." I didn't want it to end, but we're not as young as we used to be and we were all getting tired. George and I will be together again the end of March in Kansas City. Come by if you're in the area. 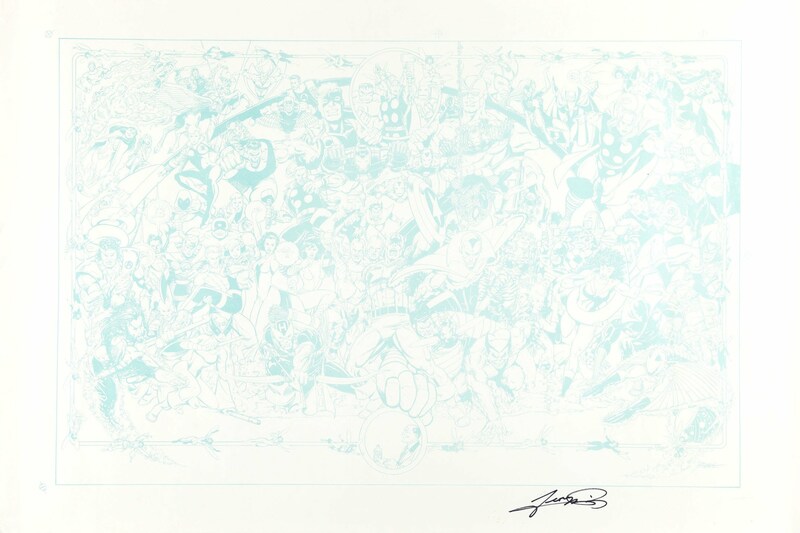 George Perez told The Continuum he's about to begin work on the fourth and final issue of the JLA/Avengers crossover mini-series. "We finally got our ducks in a row on the fourth issue and I finally got the plot to that," Perez told The Continuum Friday during the Comics & Pop Culture Convention in Pasadena, Calif.
"I'm a quarter-way inked on issue 3, so it'll be kind of nice to get back to penciling. I think they've worked on all the kinks in issue 4. We're moving ahead." Perez said noone is committing to a release date yet for the project, which is written by Kurt Busiek. "I wouldn't even hazard a guess at it," he said. "They want to schedule it when I'm working on issue 4. Now I don't know if that means while I'm penciling it or while I'm inking it. With so much anticipation going down, the one thing they don't want is the bad vibes of a book that will not be on schedule." Perez is back to work at CrossGen Comics, teaming with Barbara Kesel on the new title Solus. "I'm almost done with issue 2 now and the first issue premieres on March 26," Perez said. "Solus is a little bit less work just because of the very nature of the project and the fact that I'm not inking. I have a fine, fine inker in Rich Magyar for that. "So I try to produce the book a little quicker. On many days, I'll do two pages in one day as opposed to just one. Instead of a 6-7 hour day, I'll have 12-14 hour day in order to get back and finish JLA/Avengers." DC Comics and Marvel Comics have been slow in teasing the project, which Perez meets with approval. "I think a lot of it is they don't want it to be old news before it comes out," he said. "They don't want to release artwork that people get so used to seeing again and again and again, that sometimes when it comes out a year after they saw it initially, the excitement's gone. "I think they've managed to help promote the project to share the mystery now. Anticipation is high and living up to the hype is going to be the biggest challenge." That's a challenge Perez said he's up for. "As my swansong for mainstream characters, this is putting all my tricks of the trade to the forefront," he said. In 1971 Creation Entertainment organized its first convention, saluting comic books, animation, genre films and television, and the worlds of pop culture. Now, we return to our roots with a full-scale, all-out celebration in the media capital of the world: Los Angeles! With scores of fantastic guests, outrageous movie previews from the studios, tons of dealers and exhibitions, and much more: make your plans now to be part of the fun! Special Guest of Honor: STAN LEE - Appearing Saturday Creation reunites with Stan Lee, comic's legendary creator/writer, as we present him with our Lifetime Achievement Award. During his appearance at the convention, Stan will speak and answer questions, as well as sign autographs. Thanks Stan for helping relaunch Creation's Comic Book Conventions! NOTE: all guests are tentative and subject to change. Creation always attempts to replace guests of equal stature if a cancellation does occur.